The Egyptian Goddess, Taweret - Long before ancient Egyptians painted their first hieroglyphics depicting Taweret, the Goddess of Childbirth and Pregnancy, early man was fascinated by these creatures. The Hippopotamus was initially hunted for food, but as time passed, the animal took on a more spiritual tone. Hippos are devoted mothers and are known to be so protective of their offspring, that they will kill any competitors or enemies regardless of size or strength. As such, they became associated with Motherhood and Childbirth, ultimately giving rise to deities like Taweret. African folklore is filled with stories praising the power of the Hippo; many regions held the Hippo in higher esteem than lions. According to the Zulu tradition, it is the Hippo that is noted for its bravery, not the Lion. Bushmen recount a creation story that explains why Hippos live in the water, yet consume only grass. Since the animal is so closely associated with Water, it is also believed to be linked with Healing and Medicine. Hippos have also been engaged in relatively dark and morbid roles. Ancient Romans and Greeks brought them from the African continent to partake in gladiator games throughout the region. Even Columbian drug lord, Pablo Escobar, imported a group of hippos from New Orleans as part of his private animal collection. The group later gained a reputation for killing and maiming Escobar's enemies. In the past century, Hippos have become part of pop culture with songs like I want a Hippopotamus for Christmas (1953) and the cartoon character, Peter Potamus. Of course, who can forget spending hours playing Hungry, Hungry Hippos as a kid! Hippo Tattoos are relatively uncommon due to the fact that these animals have gained a somewhat of a negative image in Western culture. A Hippo is usually associated with Obesity, as such, the true contribution of these great creatures to human history has been slightly marred. However, there are persons who still proudly wear Hippo Tattoos, usually as an expression of a cartoon character. Whether it's a baby hippo or Gloria from the Madagascar franchise, persons get Hippo Tattoo designs as a nod to their comedic side. 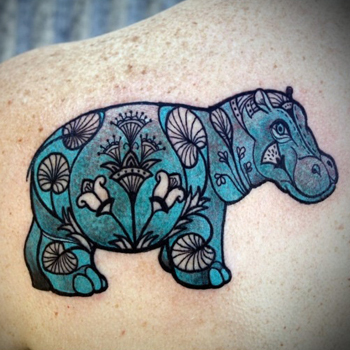 The number of factors to consider can make choosing the right Hippopotamus Tattoo design tricky. What will your new artwork symbolize? Where will it be placed on your body? Will you combine it with other elements? Does design fit your personality? Since your new ink can't be erased with a Mr. Clean Magic Eraser, it's worth the effort taking the time to create a design that you'll love. If you need some inspiration, our team can create a unique piece for you. Visit us at www.itattoodesigns.com and take advantage of our Custom Service.